2012 started slow, like every other year here in Finland. Over wintering Redwing, trip to Estonia and Pygmy owl were nice, but not much to tell about the January. Still winter in Finland. One trip to Estonia and there my first real tick for the year, Northern Hawk Owl. Also Steller´s Eider and Dipper in Hiidenmaa same time. In Finland mostly checking feeding places and Pygmy Owls in Seurasaari. Hawk Owl on my Estonian list. Second half was better, many sunny days and Suomenoja started to open. First Red Pochards, Doves and So on. Also Red Grouse trip to Estonia in end of March to first days on April. No Red Grouse... Western Capercaillie, Black Grouses and lot´s of nice people. April started in Estonia, like i mentioned. Pink-footed Goose was best. After Estonia, i finally got the Great Grey Owl. Bird was in Viikki, Helsinki. A week after Owl, i traveled to Israel with Jände and Esko. Many good species there, like White-throated Irania, Black-shouldered Kite, Bonelli´s Eagle, White-cheeked Tern, Brown Booby, Crissom-winged Finch and Sooty Shearwater. The list could easily continue, but it took too much time.. I got 22 new species on my Israeli list, what a trip! Not many days at home after Israel and me and Sarina went to the New York. It was mostly culture and shopping trip, but i had time to watch birds also. So much new for me.. Very interesting birds, especially those "dentroica" warblers. I had over 10 species of those and best specie was Protonothary Warbler. After New York, i had weekend in Hanko bird observatory. Nice arctic migration, Collared Flycatcher and good company. It was nice weekend. Me and Sarina in Central Park. June was little bit more quiet than May. I make few trips to my local birding places and Iceland Gull twitch in Nokia. Best for the month was my self found Marsh Sandpiper in Espoo. Two very nice ringing sessions with Roni and other guys. Great White Egret in Espoo and so on. Nice trip to my girlfriends summer house in Ruokolahti. Ural Owl, Greenish Warbler, Nightjahr singing contest and beautiful nature. One trip to Ämmässuo dump where we found 1cy Caspian Gull with Roni. New tick on my Finish list. On second of August i tried to twitch Pacific Golden Plover in Pyhtää, but not any succeed.. Few trips to Suomenoja and Maari, but rare birds avoided me. 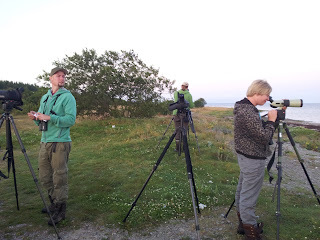 Annual Estonian bird race was in Saarenmaa and our team Muovilapajengi was on seventh place. Not bad i think. Soon after bird race, me, Jände and Esko Railo made a week trip to Ireland. Bonxies, Gannets, Fulmars, Shearwaters and many more. I got about 8 lifers in a week. Very nice! Bonxie, or Great Skua in many countries. Boys in Estonian bird race. Reed Buntings, young and older. First week of October i was in Hanko Bird observatory. Many Owls, very much ringing and Long-tailed Skua. 12th i twitched Hume´s Leaf Warbler in Helsinki, second for me in Finland. Later in October started the Pine Grosbeak migration. Hundreds of birds came south and almost every day when you walked outside, i heard or saw few birds. End of the month, 29th i found late Yellow-browed Warbler from Suomenoja. Early birthday present for me. Unlucky Slaty-backed Gull twitch.. Two different Northern Hawk Owls in Helsinki, more Grosbeaks and best bird for the month was Naumann´s Thrush in Estonia. Kihnu Lighthouse. What a beautiful place. Third of December, we twitched Western Palearctics third Fox Sparrow in Estonia. Bird of the year! More Grosbeaks, Christmas of course and Black-throated Thrush in end of the month. I have never been so active in December, but it was totally worth of all that driving and walking! Bird of the year, Fox Sparrow. So, that was my year. Not bad, or what you think?? I wish you all happy new year and lot´s of good sightings for the next 12 months.